Since 2006 Allora has been making this remarkable wine. All the fruit in this wine is grown on our own estate in St. Helena. The unique micro-climate and soil conditions are ideal for growing Cabernet Franc. We believe great wines start in the vineyard. In true Cabernet Franc fashion, floral and herbacious aromas accent wood and spice. True to its character, you?ll enjoy floral aromas with accents of leather and spice. 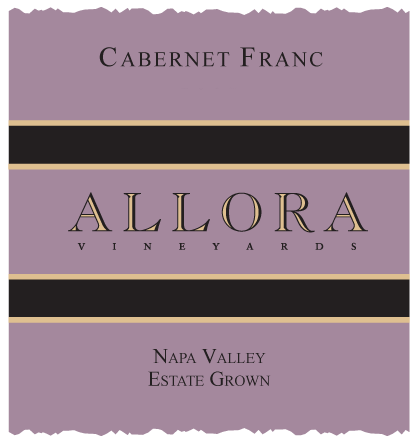 Cabernet Franc is elegant and delicious, with flavors of plum, blueberry, blackberry, chocolate, rose and sandalwood. A round full palate balances the opulent finish. A delicate purple-red coloring, scents of black pepper, rhubarb, strawberry, melon and red cherry ending in a velvety, dusty, smooth texture and a bright, lingering finish. This is an aromatic floral wine with hints of dried fruit, wild blueberries and espresso. It pairs beautifully with grilled mushrooms, artisanal cheeses and a butterflied Leg of Lamb. A resonant wine loaded with personality, this Cabernet Franc shows gorgeous mid-palate richness while notes of tobacco, espresso, mocha and sweet herbs add complexity. This silky, soft and subtle wine opens up to hints of delicate herbs mingled with lush floral notes concluding with an undeniable dark berry characteristic and lingering finish. This epic vintage reveals notes of herbs, cedar, spice box, and fruit with beautiful density, delightful tannins, a mid-weight feel in the mouth ending with a simply stunning finish. Elegantly balanced, rich and full-bodied, with deep, supple black currant, herb, cedar and spice. It is tight, focused and structured, ending with a long, complex finish.